Edited by Charles Lowe of GVSU and Patel Zemliansky – Writing Spaces: Readings on Writing is a series of 2 volumes of CC-licensed essays written as readings for the first year composition classroom. Bay College Open Educational Resources Video – A campus wide initiative to support student success. OER provides freedom from the textbook. OER allows faculty to use their own expertise rather than have the curriculum be dictated by a textbook publisher. OER textbooks give a unique voice and campus context and personalized by students. When students pay for a class, they don’t want a textbook to teach them, they want the faculty to provide insight. Dr. Matthew VanCleave, Lansing Community College, wrote an open textbook “Introduction to Logic and Critical Thinking“. Sustainable Development Knowledge Platform – Transforming our world: The 2030 Agenda for Sustainable Development > How can we use OER for this important work? 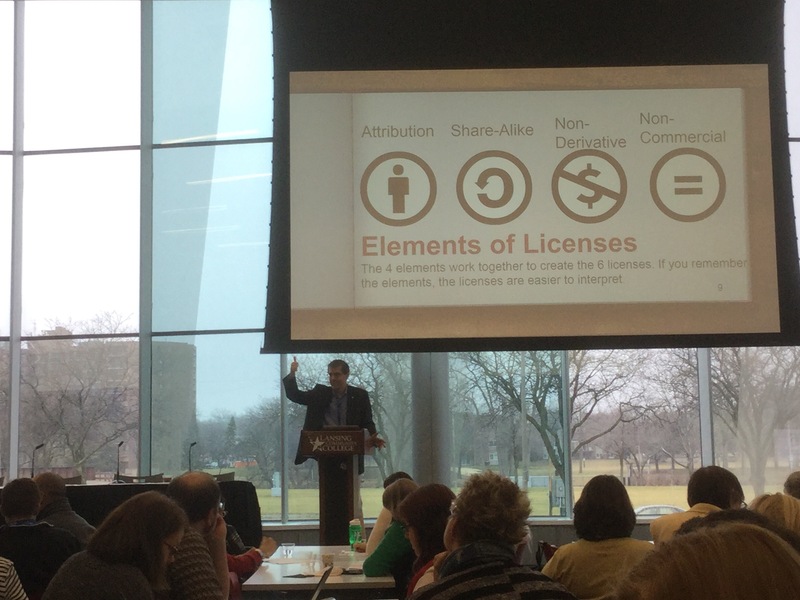 Attendees will learn about the basics of open licenses (Creative Commons) including how to add open licenses to your work and best practices for attribution. Consider your plans: Local (we can rely somewhat on fair use, library materials are paid for, we can make changes easily), Sharing (fair use is less applicable, because of distribution, subscription materials are not available everywhere), Grants (the founder may have restrictions, greater need for adaptation work, downstream users matter a lot). Teach Act allows you to make copies for spontaneous use under Fair Use of copyrighted materials. However, reusing the same article is not covered under Fair Use. Using CC licenses is beneficial because they are openly licensed. 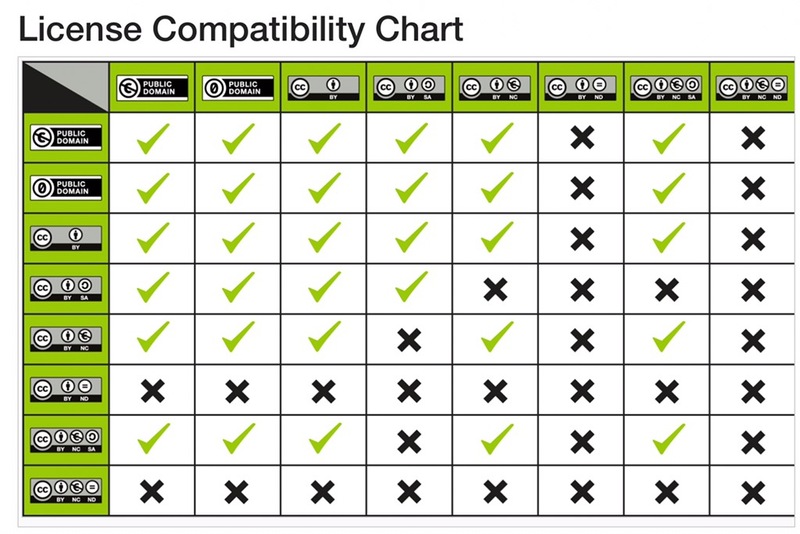 Currently the Creative Commons License is at 4.0. Goal is to maximize use and reuse. TASL – Title, author, source, license. CC Atribution 4.0 Creative Commons Marking – guidance of marking up work. E.g. “Chemistry” by OpenStax is licensed CC-BY 4.0. Remixed work can only be shared if the licenses are compatible. Openly licensed content still has copyright. Open Attribute is a browser plugin to capture CC license information. Open Attribution Builder by Open Washington which provides assistance in creating a proper attribution. Building knowledge and skills as teachers become more comfortable with flipping instruction, using iPads, seeking free resources to take advantage of 1:1, desire for MacBooks for creation. Grants and funding – MACUL provided MacBook for creation, WUEF provided MacBooks for textbook and Mac Mini for student created textbooks, TRIG – using resources for purchasing devices. Faculty Grants – Adoption (Macomb, Northwestern, Lansing CC, Mott Community College) using open textbooks. Faculty Grants – Adaption (Mott CC, Lansing CC, MidMichigan, Kirkland CC) have Psychology and Communication, American and World History and Cell Biology and Human Genetics courses adding ancillary and supplementary resources in addition to Openstax textbooks. 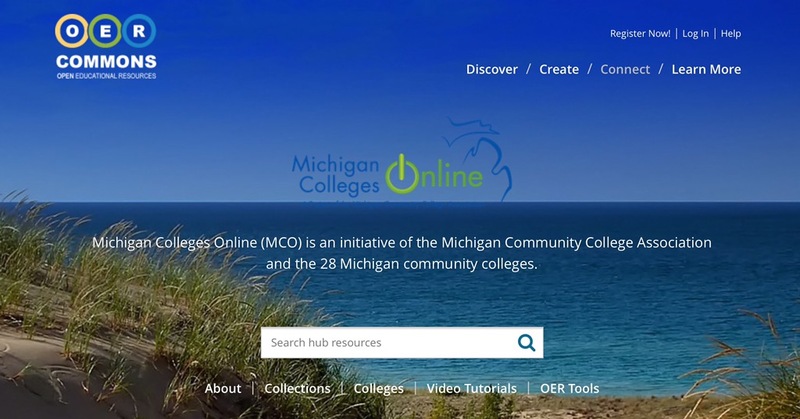 Faculty Grants – Development (Lansing CC) develop Spanish multimedia ancillary resources using virtual partners, interactive multimedia, practice exercises etc. Forensic Science (Mott CC, Genesee Career Institute) to create a full open textbook on Forensic Science. (Lansing CC) will develop a Fashion textbook and workbook on the Principles and Elements of Design. Dr. Cable Green, Director of Open Education, Creative CommonsThe Internet, increasingly affordable computing and bandwidth, open licensing, open access journals and open educational resources (OER) provide the foundation for a world in which a higher education can be a basic human right. Governments and foundations are supporting this shift with a move to open policies: requiring public access to publicly (and foundation) funded resources. Dr. Cable Green, Director of Open Education at Creative Commons, will provide an overview of open licensing and OER, and discuss specific examples where institution, provinces / states, nations and foundations have moved the default on funding from “closed” to “open.” He will also explore new OER projects that are pushing open education further into the mainstream. 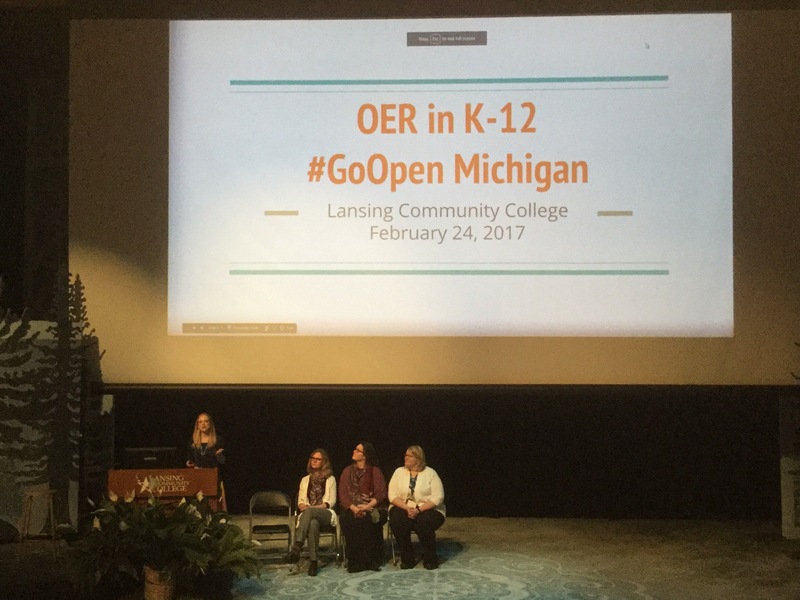 29 colleges and universities and K12 districts with 300 attendees at the 2017 Lansing Community College OER Summit. Lansing CC has an “Operation 100%” where all students will be successful. In order to meet this goal there was a need for equity and zeroing in on textbook costs. Goal at Lansing is to get zero degrees, for students and faculty. Education needs to be about sharing, knowledge, and possibilities for all students. Open is not equal to Free – Open is Free + Legal Permissions to be able to use the 5R’s. Retain is fundamental because if you don’t have a copy you can’t reuse, revise, or remix. creativecommons.org – CC is a global non-profit organization. opencourselibrary.org was created in Washington to address the spending of financial resources that are being spent. OpenStax textbooks have saved $148 million saved to date + $70 million in 2016-2017. Lansing CC is an institutional partner and so it GRCC. Open Textbook Library – open.umn.edu/opentextbooks is a curated set of resources and textbooks. British Columbia also has a resource. OER potential is saving billions per year. University of Maryland University College – Uses OER to take textbooks to zero and uses that as a recruiting tool. 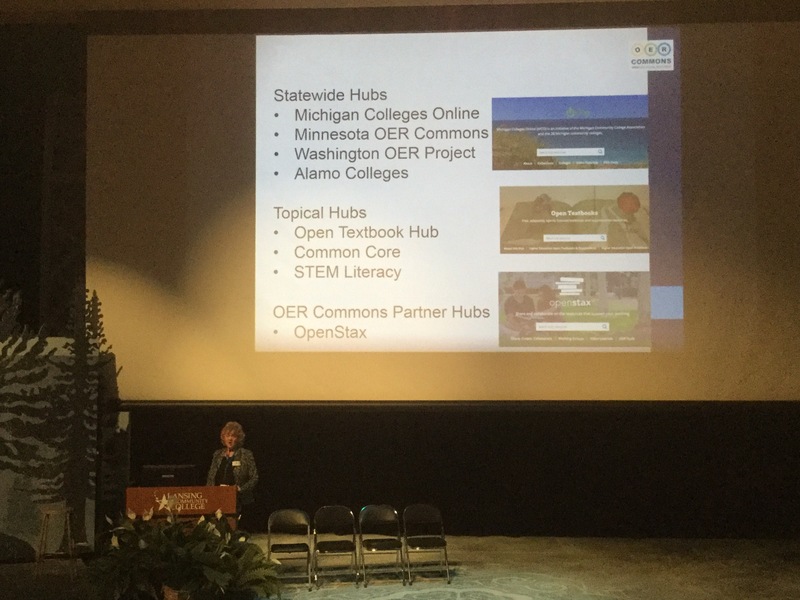 How can you find OER? John Hilton III new research article showcase that students using #oer 6% more likely to pass their classes. Let’s spend time in our courses with students to contribute to the global community, leveraging real world applicable assignments… and sharing back using open content. 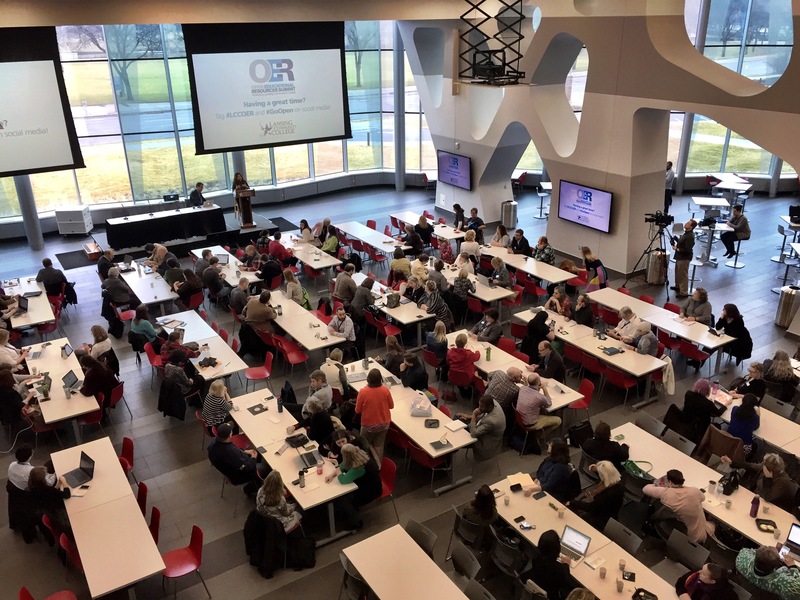 How is OER changing K12 Education? Books are on average 7-10 years old. Students can’t write/highlight in books. All rights reserved and teachers can’t update. Parents often pay for lost paper books. Save Money – repurposing financial aid spend on static textbooks for other pressing student financial needs. Keep Content Relevant, Effective and High Quality – Fix error immediately! Empower Faculty – Give faculty the best content and the ability to adapt content for benefiting students. Publicly funding projects should be openly licensed, we as taxpayers are paying for it! There is tremendous potential in leveraging open education resources in education. How can we transform teaching and learning using OER? Cable Green came to campus to kick off pilot. About 1,000 students saved $150K. Student outcomes were the same or better. Exam scores were either similar or exceeded exams of previous year. Students favored perception of cost savings. Faculty indicated they would continue using OER. Library – Finding and evaluating content, subject support, open licenses. Academic Technology – Instructional design, course integration, technology support. CEITL – Assessing student learning outcomes and faculty satisfaction. Wrote successful $385,350 grant to USNH to support growth of OER at Granite State College, Keene State College, Plymouth State University, and UNH based on success of UNH pilot. Provide funding for ambassadors for each campus ($2K) of 15 faculty. Target large enrollment courses to rapidly advance OER adoption and cost savings. Build OER awareness and make OER adoption common. Developing an institution wide survey based on Babson’s survey. Faculty senate presentation for support. System level awareness and support. $131,000 students with 1,000 students savings. Student learning outcomes were the same or better based on grades (within about 5 point difference). OER opens the doors to examine and reshape course design. Collaborating with Instructional Designers and Librarians is important. 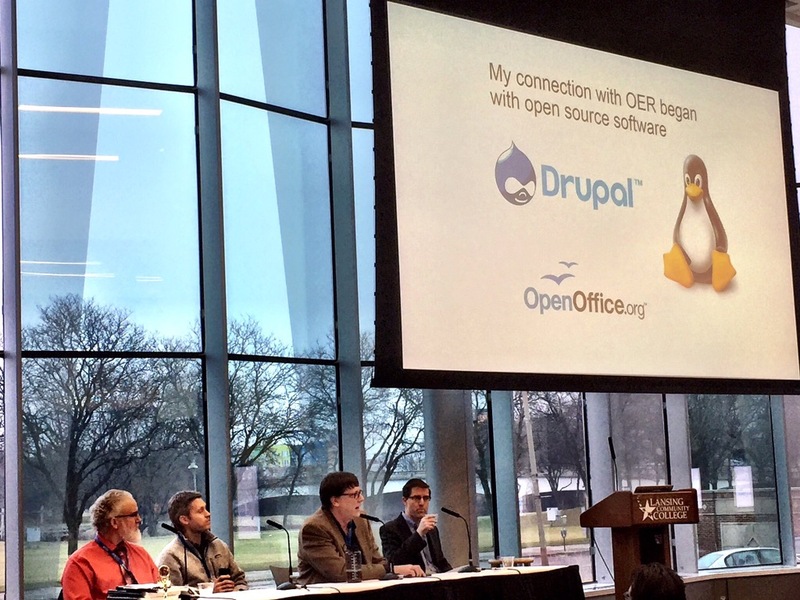 UNH Faculty Ambassadors – Highlight what UNH faculty are doing with OER. Federal student loan debt is up to 1 Trillion, and college textbooks increased by 812% since 1978. Access issues such as not purchasing the text, waiting to purchase a text, waiting for a text to arrive in the bookstore, purchasing the wrong text or edition, or misplacing/losing the text. Example: $160 for communications textbook, OER costs $0. Huge benefit is that students have access to the text the first day of class. Articulate Storyline is used for interactive assessment. Badges are awarded when 90% completed.